There are clear things to do and not do when it comes to writing sales letters. Just like with any of your sales messaging methods, you need to be sure to not be too long-winded when it comes to sales letters. The letter never be more than one piece of paper, and on that one piece of paper, you probably only want two to three paragraphs and two to three sentences per paragraph. To help make sure that it is not too long, think about someone looking at the letter and them being extremely busy. Would they see the letter and think it is too much to read and through it right in the trash without even looking at it. Or is it brief enough that the recipient will not be too resistant to scanning or reading the letter. Another thing that you will want to keep in mind is that the prospect that receives your letter may not be in a buying mode. With that being the case, you need to be cautious of them having a sales filter. A sales filter is what the prospect has that as soon as they see someone trying to sell something, their guard goes up and they begin to shut down. To avoid triggering the sales filter when writing sales letters, try to avoid talking too much about your company and products. You may be thinking, “If I don’t talk about my company or products, what do I talk about in my letter?”. One thing that you can do is shift from talking about your company and products and focus more on the value that your products have to offer. Your value is what your products or services help your clients to do or to achieve. Focusing more on this can not only help to minimize the sales filter when writing sales letters, it can also help to grab the prospect’s attention. Another way that you can grab the prospect’s attention and build interest is to share a story in your sales letter of how you have helped another client. Focus on the improvements that you made and what that meant from a business perspective. When writing sales letters, it can also help to outline the pain that you help to fix when a client purchases your products or services. One of the main things that your prospects will care about are improving the areas where they have challenges. If your letter focuses on outlining areas that the prospect has concerns and where you can help, it can grab their attention and begin to open the door. And if the prospect does not have any of the challenges that you fix, the prospect might not be a qualified prospect as they might not have a need for what you are selling. 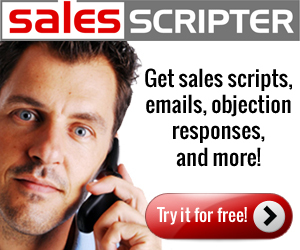 SalesScripter provides call scripts to help you with writing sales letters.